Jose Mourinho has brought eleven players to Old Trafford in his two and a bit years at the club. From Eric Bailly, who became his first, to Fred who joined from Shakhtar Donetsk in the summer. There have hits, misses and the somewhere-in-betweens. Here, Stretty News takes a look at who has impressed and who has flopped as we give each player a rating. Then have your say in our poll where YOU can vote for Jose Mourinho’s best United signing so far. Another case of “what if.” It took Mourinho a good few months for Mourinho to become convinced of the mercurial Armenian’s armoury. Mikki struggled to settle, but he was influential in the Europa League run with a glut of goals to fire United to European glory. Things quickly went south and he moved to Arsenal after 18 months at Old Trafford. A tough one this. To come to the Premier League and notch just shy of 30 goals (28 to be precise) in your first season at 35 years of age is undoubtedly impressive. Zlatan brought with him an irritating swagger and produced world class moments. But he also seemed to squander as many chances as he missed and at times seemed to slow down the play. But overall you can’t really argue with his prolific campaign in his first (and only) season in Red. Up until a few weeks ago, Lindelof would have been hovering around the 6 mark, but a string of impressive and dominant performances, including two ‘MOTMs’ against the might of Juve, have pulled him up to a 7. Such a shame he’s now injured. I’ve been really impressed with him at the back end of last season and into this. Lindelof is growing and coming of age as a Manchester United player. A poor signing. He may have scored 27 goals last season but he is just average. A woeful touch, no technical ability, no link-up play and hasn’t scored at home since April. Often gets no service, but when he does he invariably misses easy chances. Had flashes of superb centre-forward play last season, but again like Pogba he has not done enough to justify his hefty price tag. Not a Manchester United player. Speaking of which… Matic was simply brilliant in his first few months at Old Trafford. Up until around this time last season, he looked exactly like the player we’d been crying out for. Dominating the middle of the park, stretching defences with his passing, and bringing control and class to the team. Let’s not forget that worldie at Palace, but since then it’s been a steady decline for a man who has been very lucky to keep his place. He’s now a liability. Slow, sluggish and off the pace, Matic offers nothing either in defence or attack any more. Very poor – the only reason he gets a 4 is because of his form when he first came. W.T.F! Came on a wave of expectation and excitement but has been useless. 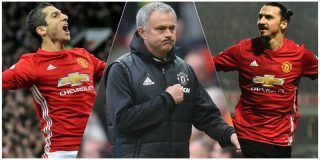 There have been a few glimpses of improvement recently but his signing – which saw Mkhitaryan move the other way – harmed not only the form of Marcus Rashford and Anthony Martial, but affected the entire dynamic of the team. Looks disinterested and has been a passenger at times. Damaged goods. Arguably didn’t need him. Having signed as one of Europe’s most eye catching players last term, but it’s difficult to give Fred a high rating because he hardly plays, for reasons only his manager knows. It will take time to adapt and he needs a run of games, rather than drifting in and out the team, to be judged fairly and properly. He’s only completed 90 minutes once since he signed. Hasn’t done too much wrong, but not set the world alight either. Mourinho already seems to have lost faith in the little Brazilian. With two and a bit appearances between them, we can’t give either Dalot or Grant a score. Dalot impressed on his debut against Young Boys but then came the Carabao Cup elimination to Derby (in which Grant came on after Sergio Romero was sent off). Neither have been seen since.